We had kind of a slow start to the day, the long drive yesterday taking its toll on both of us. When we did finally stroll down to the water to check out our snorkelling gear we were in for a nasty surprise. The waters off the coast of Australia, even in the tropics, where Coral Bay is located, are no match for the warmth of the South China Sea, or the Andaman Sea, our usual haunts. We were cold; too cold to snorkel! The locals assured us that it was warm; a balmy 24 Celsius. That’s 75 Fahrenheit by my calculations, and that is cold! We scooted back to the cruise office and inquired about wetsuits. Fortunately they were available to rent at a reasonable price, and thus equipped we caught a quick lunch in the van and headed out to sea. 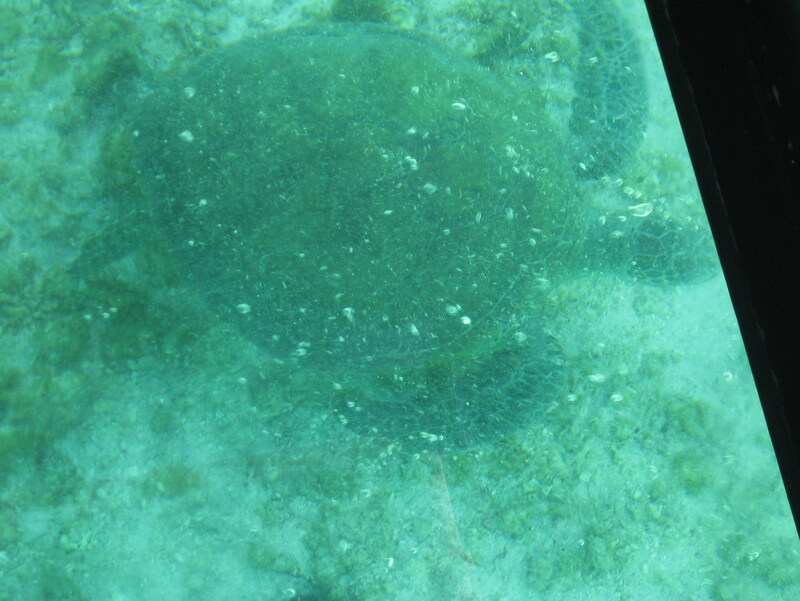 The boat was glass bottomed, and with only a few of us on board, there was plenty of room for all of us to see the wildlife floating by underneath us, and there was plenty to see. Unlike the Great Barrier Reef off the East Coast, which can take over an hour to reach by fast boat, the Ningaloo Reef starts just a few metres off shore. The coral lives in symbiosis with a plant which needs to photosynthesize to produce the food the coral live on. The coral provides the structure in this mutually beneficial arrangement. As a result the Ningaloo Reef is in shallow coastal water, and thus easy to get to and see. Some coral mounts actually break the surface of the water in low tide. On our way to the outer reef we saw an abundance of fish and a staggering variety of coral configurations. The highlight of the wildlife was a two meter long tiger shark, looking powerful and completely at ease prowling through the reef for turtles that nest in this area. With three tiger sharks on the hunt – other two just menacing shadows that we failed to float over – turtles were not abundant, and we only saw one loggerhead, too briefly seen for much of a picture. Safely down current from the sharks we anchored to snorkel. Both the coral and the fish were amazing, and after a slow start to get accustomed to the strong currents on the outer reef, they had to drag me out of the water to get underway again. I keep thinking of Finding Nemo while we explore along the coast in these waters. The animators of that show did a good job of capturing the appearance of the clown fish and the seagulls in this part of the world. Today I saw the prototype for Marvin from that film, austere and self-assured feeding among the coral. We had to settle for supper from the van again tonight. The local restaurant wanted 26 bucks for fish and chips. I guess when you are 100 clicks from the roadhouse on the main highway which is 500 clicks from anywhere significant, you can charge pretty much whatever you like. We had a baked potato and some beans from a can, and retired early again, our heads still floating from the cruises of the last few days.